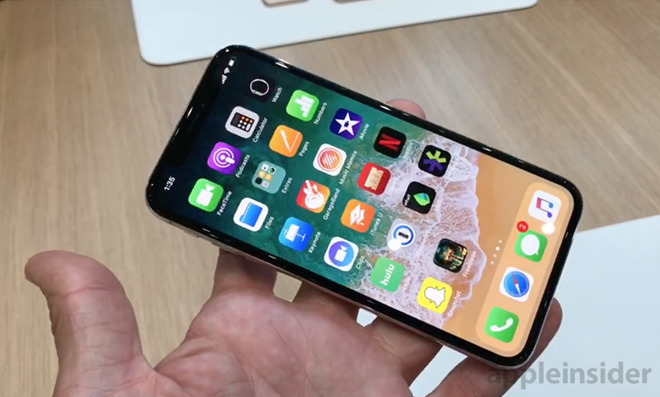 Apple is considering ways to improve the iPhone's battery life by changing the technology used in its displays, according to one analytics firm, with a switch to LTPO for the backplane potentially cutting down the amount of power required to update the screen. A research note from IHS Markit suggests Apple could make a fundamental change to the backplane of its displays, moving away from the low-temperature polysilicon thin-film transistor (LTPS TFT) that is currently used in mobile AMOLED panel production. The note's author, research and analysis director David Hsieh, suggests Apple is instead looking towards the development of low-temperature polycrystalline oxide (LTPO) backplanes. Hsieh cites three patents from Apple as evidence of this interest, with each detailing how the backplane technology associated with managing whether pixels are on or off can be improved. The patents cited include "Organic light-emitting diode displays with semiconducting-oxide and silicon thin-film transistors" from 2014, 2015's "Displays with silicon and semiconducting oxide thin-film transistors," and "Methods of protecting semiconductor oxide channel in hybrid TFT process flow" from 2018. An image spotted in one patent appeared to show the structure of LTPO, and how it compares to a similar LTPS TFT structure. While the use of an Oxide TFT, such as IGZO, would have a worse voltage threshold compared to standard LTPS usage, it would have "great merit" in low frequencies of usage, below 30 Hz, Hsieh suggests. "We estimate that Apple's target is to strengthen the graphics processing unit in the CPU, and bypass the frame memory in order to reduce power consumption," the analyst claims. As to why Apple would work on developing LTPO backplanes and other display technologies on its own without the assistance of display producers supplying panels for the iPhone, it is proposed that this would give Apple more control over components for flexible OLED screens. As well as potentially reducing power usage and to get higher-resolution displays, this may be seen as a move to better manage its display supply chain by controlling the technology, and in turn its relationship with display manufacturers. 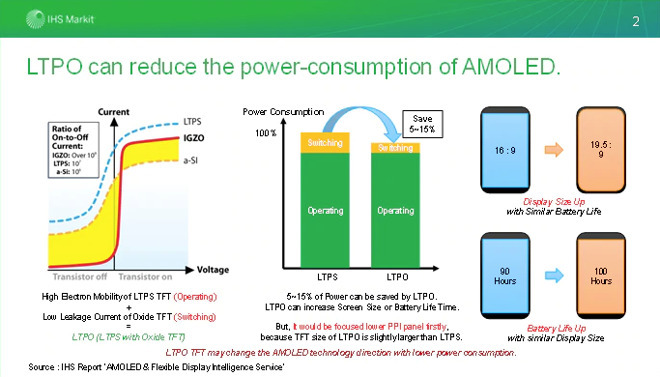 The use of LTPO could also help differentiate the panels from those produced by dominant OLED producer Samsung Display, which Apple currently sources from due to its stable supply. By owning the LTPO TFT technology, Apple could encourage other competing suppliers to improve the technology further and make the market more competitive. For consumers, this could ultimately result in a reduction in power consumption of between 5 and 15 percent under LTPO, but Apple still has some challenges to conquer before it becomes viable for mass production for future iPhones. LTPO requires larger transistor sizes in the TFT to comply with its design, as well as that of IGZO, a problem which would result in a lower resolution screen. A second issue is an increase of the photomask process, which would be 20 percent more than that of LTPS, with both more than twice amount required for amorphous silicon TFT. Increasing the photomask increases its complexity, requiring larger equipment and subsequently increasing investment. The analytics firm believes Apple will experiment with LTPO for the Apple Watch display, before introducing it in the iPhone. Given the production challenges, and the need to bring display producers onboard to work with a new technology, it is unlikely that consumers will see Apple use LTPO displays in devices for a few years at least.